Ramayana re-told by the vanquished seemed like an interesting premise and I picked it up with a lot of expectations. However, I was disappointed.The book begins well, then drags, then picks up in bits and parts but finally drags so much that you want to just quit reading. 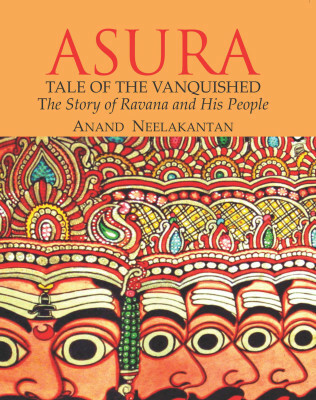 The story unravels through the voices of two persons- Ravana and a commoner Bhadra. The concept of having a third-point view of the story, told through a common man, seems novel and keeps you engaged. Some of the parts where he (Bhadra) brings out the voice of an ordinary citizen in the backdrop of an unjust life, braving against the odds and his grouses with the government of the country seems very relevant and realistic. Yet, Bhadra sometimes assumes a profile than is even larger than the main protagonist and you just want him to mind his own business after a while. Ravana, according to the original mythology, although portrayed as a demon-God, was known to have shades of goodness in him. He was an intelligent ruler and a Shiva-devotee with a great love for arts. However, in Asura, these very qualities are just mentioned in some parts and that too sketchily. Ravana comes across as a very confused person, always with conflicting thoughts, even though he has a fierce and strong ambition to succeed. His goodness rarely comes across except in his thoughts. His decisions, action and their results seem quite accidental. You don't really feel any sympathy towards this Asura who is telling his side of the story. The plot seems far-fetched in many areas and the parts where the final battle is depicted is quite outrageous. I can understand that since it is Ravana's story, Rama has to come out as an evil person. Yet, it is difficult to stomach the twisted details towards the end. I couldn't help comparing this book with The Shiva Trilogy, also a mythological fiction. Although, the third book was a let down, the book overall had a well-rounded effect with the plot flowing out naturally. The twists and plot of Asura seemed contrived and laborious in comparison. The book also was found wanting in the editing part with quite a few grammatical errors. There are quite a number of good reviews for this book and I seem to be on the minority side. So, probably this is just me and you may like it. Have you read this one? What are your thoughts? Hmm.. was hoping for another nice epic related reco from you after "Palace of Illusions" which I enjoyed thoroughly :).. Will pick it up if I see in the library anytime and will let you know if I think differently, doubt it though ;). Yeah, this was quite disappointing for me..but you go ahead and see if you like it..quite a lot of good reviews for this on the net, though. Mythology seems to be in fad now for books .What with Ashok Banker's series, Shiva Triology .. I read Ashok Banker's Ramayana but was'nt that impressed . I started reading the first book of his Mahabaratha series and could'nt even get half way through! Tastes do differ widely like you said. After the overdose of Mythology, I have now settled on 'The Glass Palace' by Amithav Gosh and thanfully am liking it so far ..
oh, not impressed with Banker's Ramayana? hmm..yeah, for now, I'm laying off from mythological fictions and gonna try a new genre.. I Love Mythology, But Hate Myths Related To This. I am Gonna To Recommend It To My brother as He Was Doing Phd. On The Asura & Yoniya. I haven't read this one. I am a fan of mythological fictions but they have to be so tight that the difference between reality and fiction should totally blur. yes, the plot has to be plausible, even if fictional.. I always look at Ravana to be a mistaken over glorified villian. I liked the book in a way that Ravana isnt glorified to be anyone.. he's shown in an almost human with loads of indecisiveness..
Not getting in the religion, it was a good one time read and like any mythology provokes thought. But I agree the ending was far-fetched surely. Yes, he is not glorified but even his good qualities were not exploited properly..he deserved better in the book, in my opinion. I loved the Shiva Trilogy as a whole, but I haven't read this one. Seems like I won't like it as much. I like the plot of telling the other side of the story too, but then again it requires a very tricky talent to do that. Don't know, Keirthana..many have liked the book, so maybe you can approach the book with a neutral mind.. Being out of India its tough for me to get hold of books by Indian authors, yet to read this one. Anyways, Ravana is an interesting character in mythology. As you said he had many positives like being an awesome veena player. He is actually, and hence my expectations with the book were high.. Welcome AS! The book does drag and gets a little boring at places.. This was epic! I loved this book. Yes it drags a little bit...but according to me there was more than the book. A depth, a perspective to life and living. I just got this book yesterday...I hope I don't join you in the minority side by the end of it...Have come here for the first time, and I loved whatever you have written..Hoping to know you more in future..